Although I am insured for such eventualities the whole episode was nonetheless not a matter that I took lightly and I naturally set out to reassess the safety and security measures that I have in place – particularly when it comes to passwords and PIN numbers used to access my financial accounts. 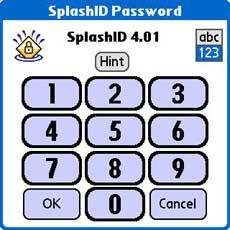 This event happened to coincide with the release of the new SplashID v4.0 and I therefore decided that the time had come to start making the most of this bestselling password security solution with my Treo 680 (also available for Windows Mobile). Aside from the fact that SplashID uses 256-bit Blowfish encryption to keep your data safe and secure, one of the features that I like most is the fact that the package includes both an application for your Treo as well as a bundled companion application called SplashID Desktop (available for Windows and Mac) which allows you to more quickly and easily view and edit information at your computer and then seamlessly synchronise it with your smartphone. 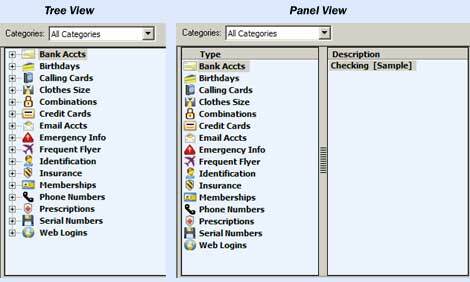 The Desktop application’s main view (above) is very simple and straightforward to use – you should not have any issues getting started adding data within 5 or 10 minutes after familiarizing yourself with the various settings. Here you get to see all of your data with its individual Fields and also a Detail View to the right for any selected entry. Twenty preset “Types” of secure data – from Bank Accounts, Credit Cards to Frequent Flyer and Web Logins – make it extremely easy to start adding information. For example, the Types > Credit Card (screenshot above) already offers pre-customized fields for your Card#, Exp. Date, Name, PIN and Bank (there are a total of 9 customizable fields available plus also a Notes section). You can keep the existing ones or create your own by selecting the “All Types” pull-down menu in the main view and choosing “Edit Types”. Besides the standard List View, the addition of a new Panel View and Tree View (detail above) are an excellent, extremely useful and welcome improvement in this latest version. There are still a few – albeit minor – usability issues though. The “New Item” button as well as seven other equally important ones are strangely located at the bottom instead of the top of the screen; there is no in-line editing which means that any changes must be made with the “Detail View” (below) by double-clicking the entry and finally that although the Password Generator is great it automatically inserts data in Field 1 instead of letting me choose where I want it and it also does not remember my password preferences. Web Auto-Fill - one click to open a website on the desktop and login automatically. Prevents keyloggers from tracking your username and password. Other features carried over from previous versions include: Adding additional standalone desktop users; Unlimited number of customizable record types and categories; Share records securely with other SplashID users; Custom icon support; Customizable field labels; Backup and restore feature; Set URL field in your records to deliver you to the correct address every time to defeat phishing attempts. Naturally, as SplashID contains all your passwords it also requires one to get into the application. You can easily access it by using a highly secure alphanumeric password (ideally between 6 and 8 characters long such as “kt52sci6”) by using your keyboard for letter entry and screen (above left) for number entry. One of the main new features of SplashID on your smartphone is that it offers an enhanced Lookup that instantly displays relevant results as you type – I have however not yet found a Global Lookup function that will search for results across all entries and not just the Type selected. Additionally, when Lookup is used the Center 5Way button should have been able to select the first search result. Viewing and editing your existing entries (screenshot above) as well as adding new ones is quick and simple since the smartphone version offers exactly the same fields and entry options as the desktop version. Additionally, Font, Row and Header Color as well as Columns customization options further help you to make the most of SplashID on your Treo. 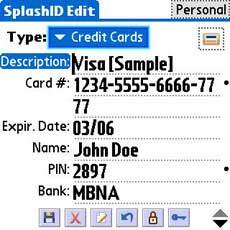 Overall, although this latest v4.0 of SplashID still suffers from a few minor usabilty shortcomings it offers an excellent, very secure solution to the increasingly difficult task of maintaining a seemingly endless number of passwords, PIN’s and other critical and sensitive information readily available while on the go. 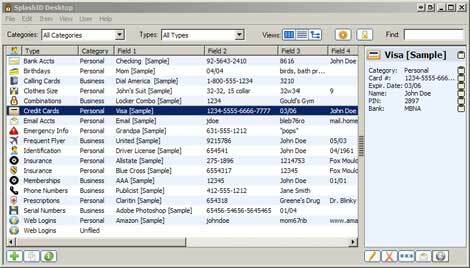 The added benefit is that the Desktop component makes it much easier to enter data while also ensuring that you always have an equally secure copy on your hard drive. These types of apps are indispensable, in my mind. I tried SpashID (an earlier version,) but eventually went with Passwords Plus from DataViz. Both are great programs, though. I use mine all the time. Every day. It's my most used application. It stores all my important data: user id and password for all the servers at work, logins for all the websites I've created accounts for, credit card info, software registration and serial numbers, etc. Lack of this type of app is exactly why the new iPhone is not even a consideration for me. It's that important. Like you said, the desktop feature is a great way to both keep a backup, and enter information. With developers creating products like these, it leaves me wondering if they will create like applications for the Foleo. I also like the ability to email encrypted files. Tony - I fully agree with the point that you make about this type of application demonstrating the limitations of an iPhone which is not open to third-party applications. This may change in the future but for now at least thanks to its huge developer community our Treo continues to have a big advantage here. I have no affiliation with RoboForm in any way, just a technologist and this tool meets my every need. Runs on USB, also has a Palm version. Hi Andrew. As a a longtime user of SplashID (actually the entire Wallet suite), I was very excited to see a refresh on this indispensable application after a long quiet period. Just a note though that the Mac version is not yet released and the new Palm application is not compatible with the old Mac desktop version. According to the Splash web page, Mac users should not upgrade to the new Palm app yet if they sync to the desktop. Splash Wallet is indispensable to me. 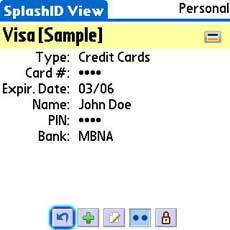 I use Splash ID for keeping track of the myriad user names and passwords, and other accounts I have. Splash Shopper is great for general list management, not just shopping lists. I use it to keep track of my music repertoire, Christmas lists, and travel checklists. Its much better than the palm memos app for list management. I use eWallet from ilium software. It seems almost identical. My eWallet was the first program that I bought for my palm and I have been bringing it to each new device that I get. I agree these wallet programs are indispensible. A must for all the internet sites. Ewallet has a password autogenerate tool that is usefull when you have writer's block. Is there any way to install the application in the card without harming the sync ability? works perfect for me for years. You may need AESLib (free as well). Thanks for the great review. I just wanted to clear up a few questions you seemed to have about using SplashID. 1. You mentioned the password generator, which you said "inserts data in Field 1 instead of letting me choose where I want it..."
The correct usage is to put the cursor in the field where you want to generate the password first, just as if you were going to type a password in manually. 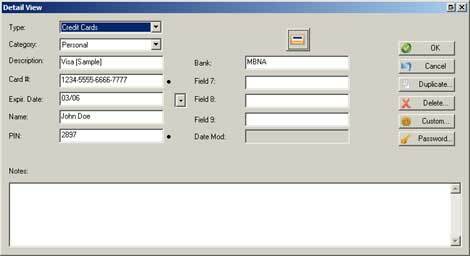 Then click the Password Generator button and the result will be inserted in the selected field. 2. You mentioned you could not find a way to do a global lookup on the handheld application. 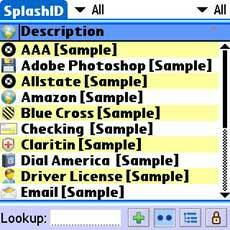 SplashID 4 searches across all fields in the displayed records. To search all records, change the Type filter to All. You may also use the Palm OS global find tool, when you have SplashID open (unlocked). If you search while SplashID is locked, the results will not be displayed because they are encrypted. I see RoboForm mentioned above, the support site says Treo 650p (PalmOS) and Treo 700p (Window$ Mobile) have "known problems" with Roboform for Palm. Anyone vouch for Roboforms for Palm on Treo 680?